Macro photography holds a truly transformative quality: it’s able to develop abstract compositions and introduce a sense of intrigue. The typically small subjects may be captured with a seldom­ seen level of detail. With a macro lens, all of a sudden the skin of an onion becomes paper­-thin and stippled with pink veins, honey becomes a cascade of liquid gold, and the smooth milky froth of a coffee becomes filled with thousands of micro pockets of air. Through the Sigma 105mm DG Macro HSM lens my subjects take on a delicate range of textures and colours, most of which didn’t even appear to exist prior to observing through the lens. The Sigma 105mm DG Macro HSM’s ability to reproduce images at a 1:1 magnification is an essential feature as it allows for the capture of the extraordinarily close detail that is unique to macro photography. Macro — referring to the scale of the world in which we exist — is able to capture a subject and project it onto the image plane at a life-size scale. And it’s with this scale of reproduction that the subject is rendered in such intricate detail. With the term ‘macro’ having been hijacked of late in order to describe anything from a point­-and­-shoot camera setting to the zoom capabilities of a telephoto lens, it’s pleasing to see that the Sigma 105mm DG Macro HSM offers true macro with a 1:1 reproduction ratio. Just as the sweet isn’t as sweet without the sour, nor does the stunning detail offered by the Sigma 105mm DG Macro look as dramatically sharp without being paired with a dreamy, out-­of­-focus diffusion. As we know, the standard formula for controlling depth of field is the aperture of the lens, with a wide-open aperture (f/2.8 or larger) resulting in a very shallow range of focus. With a maximum aperture of f/2.8 and the aid of a rounded nine-­blade diaphragm, the Sigma 105mm DG Macro HSM provides the ability to melt away the surroundings with a buttery, out­-of-­focus quality. Enjoy the accident — when you’re preparing a dish and perhaps a few crumbs fall away or sauce dribbles onto the table, take a glance through the lens — it might be worth leaving them there. A bit of mess adds charm, offers a sense of realness, and makes the scene approachable to a viewer. The emergence of disorder within an otherwise pristine composition provides a sense of honesty. This is a genuineness that is lacking in the highly styled images of fast food that we encounter every day, images which are almost plastic in their perfection. The rigidity of this level of perfectionism can often result in an image that is very well executed, but remains bland and unoriginal. On the other hand, a well-considered disruption to the composition can create an enjoyable aesthetic tension. With the Sigma 70mm DG Macro, taking a looser approach to shooting cuisine was easy due to its focus­-limiting capabilities. When shooting in macro, autofocus is generally not utilized in favour of the precision offered by way of manual focusing. Most would agree that shooting in manual focus generally results in many more ‘keepers’. 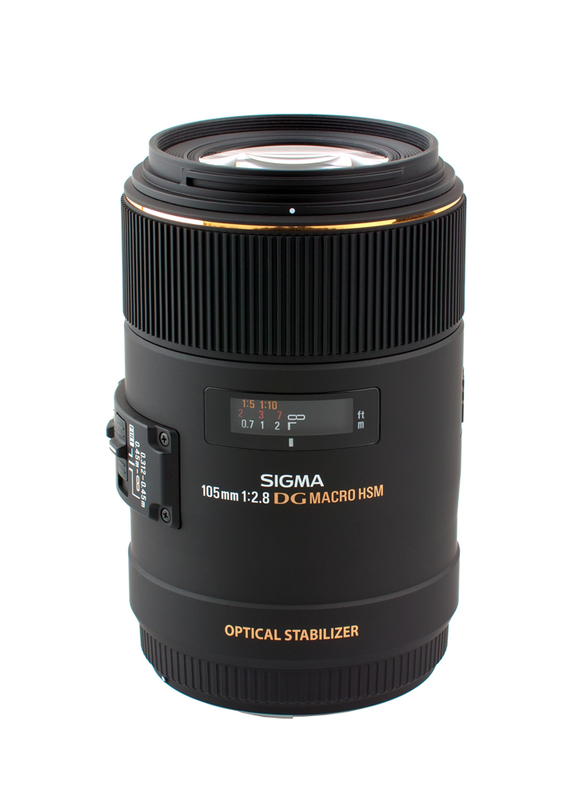 However, the Sigma 70mm DG Macro provides a handy focus-­limiter switch that makes the use of automated focus possible. It works to increase the speed and accuracy of autofocus by limiting the focus range that it searches within. Avoiding excess autofocus hunting, the limiter switch allows for a far more candid approach to close-­up photography. Every drip, drop, or spill can be captured in ultra­-sharp clarity by this lens’ focusing mechanism. While there’s no doubt that a successful image can be created by way of a single flash, camera­mounted flashes are generally off limits when photographing food. Pouring in directional light from a single source will flatten your dish, erasing subtle light variations, and dispelling any natural shadows present. The best option is to make the most of the natural light available and shoot with a lens that offers a bright, wide aperture — a lens such as the Sigma 17–70mm DC, featuring an aperture range between f/2.8 and f/4, fits the bill. If natural light has disappeared for the day, interior spot lighting can be managed in-­lens to create some pretty effects — one effect, commonly associated with food photography, is bokeh. One of the most misunderstood and misused terms within the discipline of photography, bokeh is an adaptation of the Japanese ‘boke’, which loosely translates to ‘blur’. While bokeh can only be achieved through a shallow depth of field, it’s important not to confuse the two, as not every photograph that utilizes a wide aperture contains bokeh. More specifically, bokeh refers to the quality in which a lens renders out-­of­-focus points of light. While subjective, some lenses offer more attractive rendering of light within out­-of-­focus areas than others. Here’s how: the smoothness of bokeh depends on the construction of the diaphragm blades within a lens. Most lenses are equipped with between 5–14 blades, in straight or rounded variations. Straight blades create an aperture that is pentagonal­-shaped, while rounded blades form one that is near­-circular. Most agree that, as per the construction of the Sigma 17–70mm DC, a series of nine rounded diaphragm blades are ideal in producing specular highlights that are smooth, circular, and non­distracting. Shooting within the art­-deco styling of the Hotel DeBrett bar, the Sigma 17–70mm DC performed well in rendering spot lights and reflections into soft, unobtrusive bokeh. It seems contradictory to shoot cuisine through a wide­-angle lens. However, when the opportunity arose to test Sigma’s widest aperture available — f/1.4 — the dimly lit character space of Wynyard Quarter’s Miss Clawdy restaurant seemed a perfect location. With the ability to create narrow focal planes with consistent edge-­to­-edge illumination, the Sigma 24mm f/1.4 has impressive performance capabilities. This aperture is ideally suited to working within the restaurant’s dim ambience, formed by way of dark­-wood panelling and low-hanging bulbs. Even a meticulous arrangement will fall flat if an incorrect aperture and shutter speed render the composition a blurry affair. Of course, there are numerous ways to accommodate low­light conditions — the use of a tripod, adopting a brace position, or altering the ISO. However, in consideration of maintaining image quality and handheld manageability, we first look to the aperture. Compared to the next ­best f/2.8 options, Sigma’s f/1.4 aperture allows approximately four times as much light to reach the sensor, allowing for the use of increased shutter speeds, even in subdued light. However, this type of photography is not only about food on a plate, but also what exists around it. At a minimum focusing distance of around 25cm, the wide-­angle Sigma 24mm f/1.4 allowed for a sense of the environment to creep in. It’s generally very difficult to diffusely blur the background with a wide­-angle lens, but an f/1.4 aperture with a close subject can do just that. As a result, the image not only portrays an exquisitely assembled dish, but also an illusion toward a story, formed through the accumulation of dishes on the table and nestling of chairs. The use of a narrow depth of field paired with a busy scene is effective in forming an indication toward the environment, without allowing for distracting or unsightly additions within the frame. It’s a well-­known rule — when using a DSLR, any exposure longer than 1/60 should be aided by way of proper stabilization. Of course, many lenses have image-­stabilization capabilities, and most of us are well­-versed in the numerous arm-­bracing techniques that lend to steady handling. However, when working with up-­close or macro photography, unwanted movement such as camera shake is often further exaggerated, turning razor­-sharp details into a fuzzy mess. 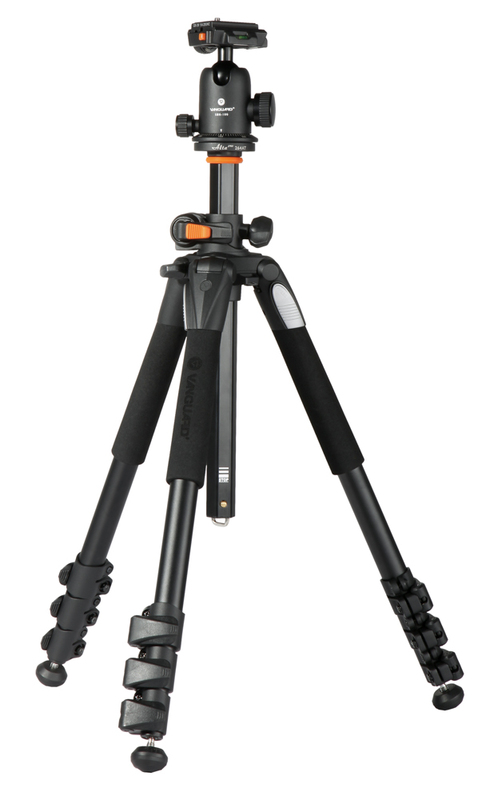 The sleek Vanguard tripod was an essential piece of equipment in the photography of these tasty subjects, dish after delicious dish. Lightweight for even the feeblest of arms, and able to fold down to a surprisingly compact size, the tripod was convenient while navigating busy Auckland restaurants. Switching back and forth between tripod and handheld use was a painless process — the quick-­release head meant that it was simply the press of a button to slide the camera plate off. It’s no wonder Vanguard promotes its hallmark as versatility and flexibility. Gone are the days of the lengthy tripod set­up — and rightly so, we don’t want our food getting cold. The BBH­-100 magnesium ball head is remarkably smooth due to its scratch­free, oxidized surface. Its open­-body design allows for a lighter weight, while maintaining its ability to support heavier macro lenses, swivel all the way around, and tilt from a range of ­35 to 90 degrees. Finally, a rapid level system allows for the levelling of camera to base, invaluable for precise macro shots where, in-lens, a millimetre becomes a mile. For more information on the gear featured throughout Gearducated, visit crkennedy.co.nz.